The PX discussion clearly caused significant disagreement at Linde and the fall out at the senior management level is significant. We believe that this opens Linde up for an acquisition, by either PX or APD. See prior research. It is our view that the negotiations with PX most likely broke down because PX made a strong case as to why its management should lead the company, but they were trying to get control without a control premium, through a merger of equals. The leadership change at Linde – in our view – now opens the company up for a bid, most likely from PX or possibly from APD – which, as we have noted before would be a very distant third in the rankings if a PX/Linde deal happened. APD has a higher multiple and a better balance sheet than PX and with the imminent separation of Versum, needs to be looking for the next move. The issue will be all around premium and how much Linde is really worth. Looking at possible improvements in margins at Linde, one could justify a price well above where the stock trades today, if you assume these can be brought closer to PX or APD levels. But any bid is going to need a structure which reflects some potentially painful divestments to keep regulators happy, and is likely to be caveated with discounts to be applied should certain divestment thresholds be reached. A bidding war could be good for Linde holders and bad for PX and APD, though ultimately only bad for the eventual winner. In our view this would be a short-term issue for either PX or APD – stock weakness on possible risk and dilution, but ultimately the consolidation and synergies would drive EPS growth for many years and probably to a higher level that either company could achieve alone. We believe that PX probably needs this deal today more than APD, but the longer it drags out the more likely APD is to jump in. We would own the Europeans over the US companies – Air Liquide has plenty of interesting opportunities with Airgas and is relatively inexpensive and we do not think the Linde story is over. 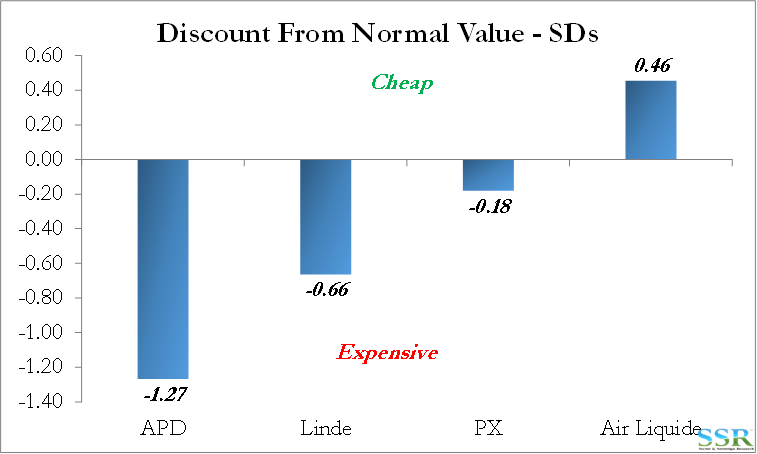 Risk would be that APD persuades Linde to buy APD – good exit strategy for APD – expensive and dilutive deal for Linde.